Football fever hits Singapore at full force this June with the start of the 2018 World Cup this week! 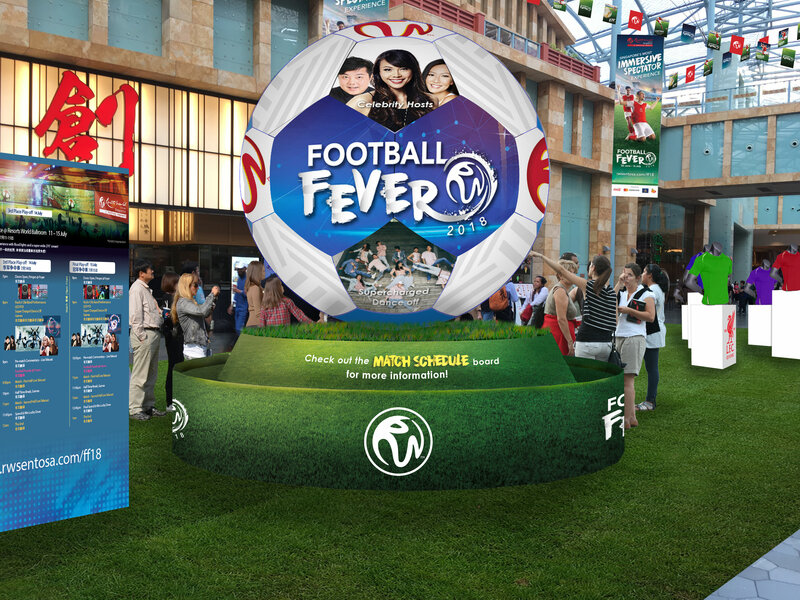 And to make things even more fun, Resorts World Sentosa will be joining in on the football action from 30th June to 15th July with Football Fever 2018! With Football Fever 2018, Resorts World Sentosa’s Theatre and Ballroom will be transformed into celebratory spaces for two weeks and transports fans right into the heart of all the sporting season as the Round of 16 kicks off on 30th June. Guests can enjoy the Semifinal and Final matches on 11th, 12th and 15th July in the comfort of the Ballroom and displayed on seven glorious super-wide high definition screens to provide a 270 degree viewing experience, complete with soccer turf and floodlights to give the full impression of being at an actual stadium. Prior to that the Round of 16 and Quarter Final matches will be screened at Resorts World Theatre, and can enjoy the matches while lounging in multi-tiered football pitch seats simulating the sports arena. All screenings are shown in high definition, and audiences will even be in for a surprise each time a goal is scored – larger than life virtual cheerleaders will appear on screen to bring audiences into a cheering fervor, and will have you yelling ‘GOAL!’ from the top of your lungs as you watch their animated cheerleading routine. All live screenings are shown free of charge, while local celebrity commentator and diehard soccer fan Jamie Yeo will also be in the line-up to engage the crowd in person with her sharp and insightful commentary from the quarter through the grand finals. Besides the screenings, fans will have a chance to take part in a host of other exciting peripheral activities to keep their fists pumping throughout the night. Come face to face with local football heroes and legends such as Fandi Ahmad, Lee Man Hon, Nazri Nasir, Aide Iskandar and more from the golden age of Singapore football, who will be making personal appearances at RWS on 30th June and 1st July from 7pm – 8.30pm. Fans might even be able mingle with these legends via specially organised interactions and friendly matches. What’s a football night out without beer and bites? Guests can top up their free viewing experience with just a little extra to purchase regular and VIP packages to complete their experience, and come with premium beer and delicious bar bites (free flow for both for the VIP packages), keeping you quenched and satiated throughout all the sporting action. What’s more, with every purchased package, guests get to take part in a lucky draw and stand to win attractive prizes from Razer, Mileslife, and Coca Cola. A VIP package entitles guests to five chances, while a regular package entitles them to one, and every additional $10 spent on food and beverages at the event venues earns attendees an extra chance. Guests then drop their chance cards in a box representing the teams in action, and at the end of every match, one lucky winner will be randomly selected from the box belonging to the winning team. And if you feel like you need a break between matches, feel free to enjoy local youth talents such as hip hop, street jazz and b-boy dancers, mesmerising LED POI dance moves, and even big-hearted rock bands showcasing a repertoire of English, Mandarin and Cantopop hit songs. One particular highlight involved freestyle soccer team Urban Street Team, where dance and soccer acrobatic moves meet. On selected dates, guests can even head over to The Forum to catch a Football Parade comprising cheerleaders, dancers, stilt walkers, drummers, and freestyle footballers. Other fringe activities guests can take part in include foosball, beer pong, and electronic darts, giving you that complete football night pub experience even at RWS. Kick Off your game on with RWS as they gear up for football season and thrust you into the heart of the action with Football Fever 2018, guaranteed to enhance your World Cup viewing experience and feeling the full impact of every goal scored.